LONDON, April 19 (Reuters) – Energy market professionals estimate there is a 40 percent chance of the U.S. economy entering recession before the end of next year, rising to a little over 50 percent before the end of 2020. The results are based on a survey sent by Reuters to 7,000 energy market professionals between April 13 and April 17, with responses received from 700 (tmsnrt.rs/2Hdyw4e). There is a wide dispersion of views, and most see only a low risk of recession in 2018, but the assessed probability increases significantly in 2019 and especially 2020. The state of the global economy is one of the most important drivers for oil consumption and prices, so the economic outlook is crucial to the calculations of OPEC and other oil suppliers. The United States now accounts for less than one-fifth of global economic activity, but the rest of the world is unlikely to grow strongly if the United States is in recession, so it makes a useful proxy for global growth. Predicting turning points in the economic and trade cycles is notoriously difficult, but the current global expansion shows increasing signs of maturity and escalating trade tensions create clear downside risks. OPEC and its allies, as well as other oil producers, need to incorporate the increasing probability of a U.S. recession and global slowdown when projecting oil consumption and prices in 2019 and 2020. 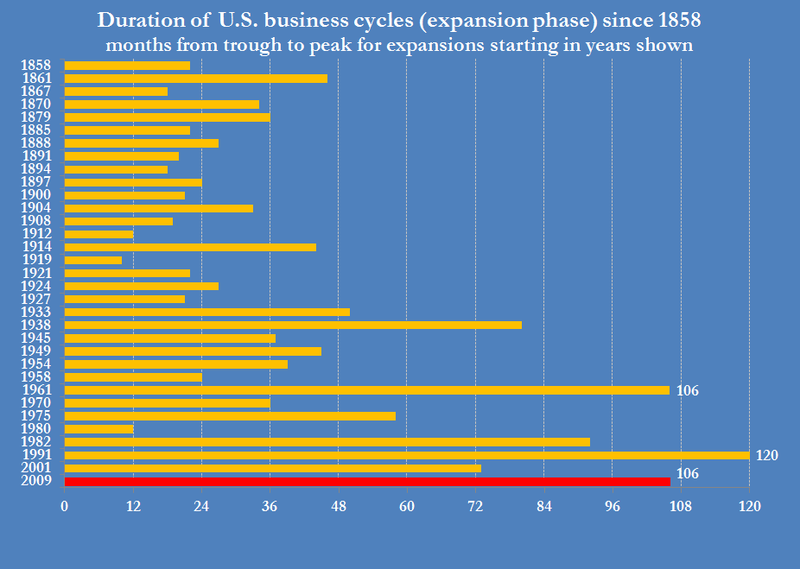 The current U.S. economic expansion started in July 2009 and is already 106 months old, according to the Business Cycle Dating Committee of the National Bureau of Economic Research (tmsnrt.rs/2JapXYP). The current expansion will become the second-longest on record next month, surpassing the long boom of the 1960s. If the economy is still expanding in July 2019, it will become the longest on record, passing the long boom of the 1990s. The U.S. expansion is part of a synchronised global upturn in industrial activity and trade that is lifting consumption of oil and other commodities. The global economy continues to display broad-based momentum and is predicted to remain healthy in 2018 and 2019, according to the International Monetary Fund. World output increased by 3.8 percent in 2017 and is forecast to rise by 3.9 percent in both 2018 and 2019 (“Global economy: good news for now but trade tensions a threat”, IMF, April 17). Global trade volumes increased last year at the fastest rate since 2011, when the global economy was still rebounding from the financial crisis, according to the World Trade Organisation. The WTO forecasts trade will grow nearly as fast in 2018 and 2019, which would be the best run of growth since before the financial crisis (“Strong growth in 2008 rests on policy choices”, WTO, April 12). The current cyclical expansion has considerable momentum in the short term, which should ensure that it continues in the short term, but there is increased anxiety about whether it will be sustained in 2019 and 2020. Both the WTO and the IMF have warned about potential downside risks arising from increasing trade tensions between the United States and China. The recent exchange of tariff threats between Washington and Beijing contains a substantial element of bluffing so it is hard to estimate the risks that the threats will turn into an actual trade war. But even if the tariffs are never imposed, the increased uncertainty could have a damaging impact on business confidence and investment plans. Survey respondents were evenly divided about whether the trade tensions would have a damaging impact on global growth. Some 48 percent thought trade tensions would harm growth between 2018 and 2020, which also implies 52 percent thought they would not or were unsure. Respondents from North America were slightly less concerned than those in other regions, about the effect of trade threats, with only 45 percent thinking they would prove harmful. In contrast, respondents from other regions put the probability of trade tensions damaging global growth marginally higher at 53 percent. U.S. respondents may be more sanguine about the use of tariff threats as a negotiating tactic and/or that tariffs would benefit the domestic economy. Respondents from the rest of the world are slightly more worried, perhaps more concerned about the risk of miscalculation and the damage to confidence.